No meu trabalho sou obrigada a falar, ler e escrever nas duas línguas por isso penso em cada uma delas de maneira diferente. Como tal, é natural que o que lerem em português difira um pouco do que vou escrever em inglês. Não sei se este formato de texto intercalado é o melhor, por isso agradeço as vossas sugestões. Dear readers, I've finally decided to free you from that Master of Torture called Google Translator. Many of you come here through my Pinterest page and I know you get stuck firstly by the Portuguese and then - if you find yourselves brave enough to give it a try - by the awful translations of my recipes/tutorials made by Google. I hope this new format will suit you better. Please don't be shy to leave your comments, they will be most welcome and appreciated! Having said that, let me show what I did for my baby boy first birthday. 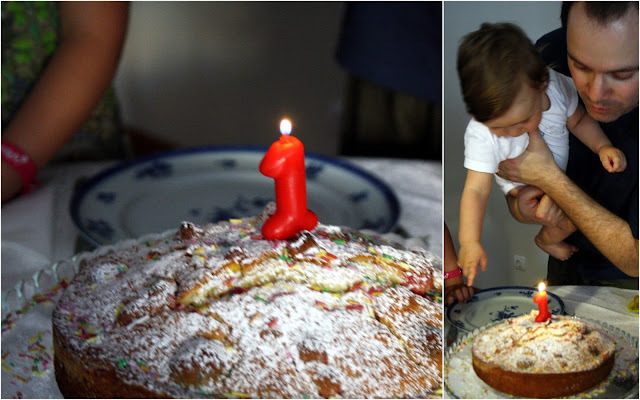 Fazer um bolo de aniversário para um bebé de um ano é algo desafiante. Só a partir do ano é que supostamente começam a comer coisas tão elementares para a confecção de um bolo como leite de vaca ou clara de ovo (como os meus filhos têm risco máximo de alergia, eu tento ser certinha nesse campo, bem me bastou a reacção que a Cat fez ao leite de vaca quando o bebeu pela primeira vez). Como tal, o bolo tinha que ser simples, sem chocolate, sem cremes, enfim, sem aquelas coisas que transformam um bolo banal num bolo de aniversário.Quando andava à procura de ideias, cruzei-me com algo que me pôs literalmente a babar: este polka dot cake. Adorei o conceito, o aspecto, a ideia e achei que teria que ser este o bolo especial para o meu pequeno Tiago. Ou melhor, a versão adequada do mesmo para um bebé, sem creme. Encontrei umas formas para cake pops (imprescindíveis para fazer as polka dots), mas comprei com várias formas (estrelas, corações, cupcakes) o que se revelou um erro. O que realmente se aguenta no bolo quando se corta em fatias são as bolas por isso se forem comprar, comprem só as de bolas. Both my kids are at the high risk group for several allergies (damn you, genetics! ), so I generally try to go a little by the book when introducing new foods in their diet. Egg whites and cow milk were 'forbid' by their pediatrician until turning one. I had introduced the egg white about two weeks ago with success but the cow milk was introduced only yesterday (six years ago, my daughter had a severe skin reaction when I introduced the cow milk). Well, trying to make a cake with no chocolate, no nuts or no creams makes the life of a 'baker' a little more dificult... so finally being allowed to use egg whites and cow milk... well it was definitely a game changer! When looking for ideas, I totally fell for this polka dot cake. I managed to buy a cake pop mold, but wrongly choose the one with several different forms. I should instead had bought the one only with the spheres, which ended up to be the most reliable). Beat the butter at room temperature with the sugar until fluffy. Add the whole eggs, slightly whisked, the vanilla extract and beat very well. Add the flower and the baking powder and mixed all together. If needed, add a couple of milk spoons to get a slightly runny batter. Divide the mix in three (or in whichever portions you desire) and add the food colorings of your choice. I used yellow for the stars, blue for the spheres and red for the hearts. Fill the closed part of the mold with the batter (be generous with the filling, I think I should have used a little more batter in each one. Peneirar a farinha, o fermento e o sal numa taça. Misturar com as varas as claras e o leite noutra taça. Numa terceira taça, esfregar a raspa de limão no açúcar até este ficar bem húmido e aromático. Juntar a este açúcar a manteiga à temperatura ambiente e bater até ficar leve e muito fofo. Juntar o extracto (saltei este passo) e adicionar um terço da mistura da farinha, batendo em velocidade média. Juntar metade da mistura das claras, envolvendo bem, e repetir o processo farinha, claras, farinha. Bater a massa durante cerca de dois minutos, até estar bem foca e cheia de ar. Sift together the flour, baking powder and salt. Whisk together the milk and egg whites in a medium bowl. Whisk together the sugar and lemon zest in a mixer bowl or another large bowl and rub them together with your fingers until the sugar is moist and fragrant. Add the butter and beat until the butter and sugar are very light. Beat in the extract, then add one third of the flour mixture, still beating on medium speed. Beat in half of the milk-egg mixture, then beat in half of the remaining dry ingredients until incorporated. Add the rest of the milk and eggs beating until the batter is homogeneous, then add the last of the dry ingredients. Finally, give the batter a good 2- minute beating to ensure that it is thoroughly mixed and well aerated. Untar uma forma de mola com manteiga, forrando o fundo com papel vegetal. Distribuir os mini-bolos pelo fundo e deitar a massa por cima. Deverá ficar bem coberto (não foi o caso do meu porque não fiz a receita completa do bolo da Dorie). Levar a forno pré-aquecido a cento e 180º entre trinta e quarenta minutos. Deixar arrefecer bem, polvilhar com açúcar de pasteleiro e com confetis coloridos. Grease well a round pan, using some baking paper in the bottom. Distribute evenly the mini-cakes in the bottom and cover with the cake batter. Bake in pre-heated oven at 180 degrees celsius for about 40 minutes. Let it cool and sprinkle well with confectioners sugar and edible confettis.